Juan Carlos Ramírez...On Twitter: @jcramy56...First name is spelled "JC"... Pitched for Nicaragua in 2013 World Baseball Classic qualifiers in Panama City...Entered 2009 ranked by Baseball America as fifth best prospect in Mariners organization... Pitched for La Guaira in Venezuelan Winter League in 2012-13, Carolina in Puerto Rican Winter League in 2014 and Culiacan in Mexican Winter League in 2015...Originally signed by Mariners scouts Luis Molina and Nemesio Porras. Began season with Angels in a Major League starting rotation for first time in career... Had season cut short after suffering right elbow strain in second start of year on Apr. 7 vs. Oakland... Underwent right elbow UCL reconstruction ("Tommy John") surgery Apr. 17 with Dr. Neal ElAttrache and missed remainder of season. Established single-season career highs with 11 wins, 105 strikeouts and 147.1 innings pitched for Angels...The 11 victories led Halos pitching staff ... Opened year in bullpen, making three relief appearances before joining starting rotation...Was one of three Major League pitchers with two wins in relief during Opening Week of the season ... Pitched in 111 career Major League games (all in relief) before making first career start on Apr. 14 at Kansas City…Became fifth player to make his first MLB start as an Angel after making 100+ relief appearances to start career, and first since Al Levine (Oct. 2, 1999 vs. TEX)…Other three to make first start as Angel after 100+ relief appearances are Dyar Miller (1979), Luis Sanchez (1983) and Doug Corbett (1984) ... Set career high with nine strikeouts on Apr. 19 at Houston & matched that total on Apr. 30 at Texas ... Completed at least seven innings pitched six times, which was tops on Angels ... With five game road win streak from Apr. 30 - June 24, became first Angels pitcher to win five straight road starts since Jered Weaver won six straight from June 27 - Aug. 22, 2012 ... In 10 road starts from Apr. 30 - Aug. 19, went 7-2 with a 2.93 ERA (58.1 IP - 19 ER)...Ranked fifth in American League in ERA in that span ... Suffered right elbow strain in start Aug. 19 at Baltimore and missed remainder of season on disabled list. Made Reds debut on April 22 aft er opening season at Triple-A Louisville...Matched career-high with three innings pitched on April 22 vs. Cubs...Earned first Major League save on May 30 at Colorado (0.1 IP)..Set career-high on June 15 with six strikeouts…Became fi rst Reds pitcher with six strikeouts in two innings pitched since J.J. Hoover in 2014..,.Claimed off waivers by Angels on June 26...Made Angels debut June 27 vs. Houston and became fi rst Nicaraguan born player in franchise history...Earned fi rst win with Angels on July 18 vs. Texas aft er tossing 1.2 scoreless innings...Recorded fi rst save with Angels on Sept. 28 vs. Oakland...With Angels, stranded 11 of 14 inherited runners. Earned first Major League win in Diamondbacks debut on May 10 vs. San Diego (2.2 IP, 1 ER, 4 H, 1 BB, 3 SO) ... Traded by Arizona to Mariners on July 26 for cash considerations ... Tossed two scoreless innings in Seattle debut on Sept. 8 vs. Texas...Did not allow a run in four of first five outings with Mariners. Did not pitch in Majors...Spent entire season in Indians organization with Double-A Akron and Triple-A Columbus. Split the 2013 season between AA Reading, AAA Lehigh Valley and the Philadelphia Phillies, going a combined 5-2 w/a 4.04ERA in 34 combined Minor League relief outings (49.0IP, 44H, 22ER, 25BB, 44K, .232AVG)...Had his contract selected and was added to the 40-man roster on June 22 and made his MLB debut the next day vs. the NY Mets...Faced 17 batters w/o allowing a hit to begin his career (4.2IP, 5 scoreless games to begin career)...Was designated for assignment on 8/2 before having his contract selected again on August 25...Had a 14.1-inning scoreless streak that spanned 9 games at AAA at the time of his Aug 25 call-up… Went a span of 10.2 IP (617-8/19) without allowing a base hit at LV (opp. hitters were 0-37 in that span)...Posted a 9.31 ERA (20 ER, 19.1 IP) over his final 13 games after making 5 scoreless appearances to begin his career, allowing an ER in 10 consecutive appearances (7/7-9/15) at one point...He elected free agency after being outrighted off the Phillies' 40-man roster on October 16. Pitched in relief all season... Began the season with Reading (AA)... Had 8 straight appearances of at least 2.0 innings, 4/13-5/8... Held Eastern League hitters to a .200 AVG (20-100)... Promoted to Lehigh Valley (AAA) on 6/4... Posted a 0.98 ERA (2 ER, 18.1 IP) in his final 12 games. Spent the season with Reading (AA). ... Led the Eastern League in CG (3); ranked T-1st in SHO (1)and T-2nd in wins (11). ... Tied Trevor May (Clearwater) for the organizational leadin CG. ... Named Phillies Minor League Pitcher of the Month for April (4-0, 1.03 ERA). ... Threw the 2nd SHO of his professional career, 4/23 at Akron (7.0 IP, 3 H, BB, 4 SO). ... Allowed 2 hits and 1 unearned run over 8.0 IP in a CG loss, 7/7 at Bowie. ... Struck out 34 batters in 35.2 IP in July (6 GS); did not have more than 16 SO in any other month. ... Ended the regular season with 3 straight wins, 8/22-9/2 (3-0, 2.12 ERA). ... Allowed only 1 hit over 6.0 scoreless innings and earned the win in Game 2 of the EL Playoffs, 9/9 at New Hampshire. ... The only hit he allowed came with 2 outs in the bottom of the 5th inning (double). 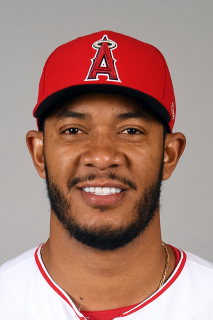 February 23, 2019 Los Angeles Angels placed RHP JC Ramirez on the 60-day injured list. Recovering from Tommy John surgery. November 2, 2018 Los Angeles Angels activated RHP JC Ramirez from the 60-day disabled list. May 4, 2018 Los Angeles Angels transferred RHP JC Ramirez from the 10-day disabled list to the 60-day disabled list. Right elbow strain. April 8, 2018 Los Angeles Angels placed RHP JC Ramirez on the 10-day disabled list. Right elbow strain. November 6, 2017 Los Angeles Angels activated RHP JC Ramirez from the 60-day disabled list. September 1, 2017 Los Angeles Angels transferred RHP JC Ramirez from the 10-day disabled list to the 60-day disabled list. Right elbow strain. August 21, 2017 Los Angeles Angels placed RHP JC Ramirez on the 10-day disabled list retroactive to August 20, 2017. Right elbow strain. June 27, 2016 Los Angeles Angels activated RHP JC Ramirez. June 26, 2016 Los Angeles Angels claimed RHP JC Ramirez off waivers from Cincinnati Reds. April 22, 2016 Cincinnati Reds selected the contract of RHP JC Ramirez from Louisville Bats. April 6, 2016 RHP JC Ramirez assigned to Louisville Bats. December 30, 2015 Tomateros de Culiacan placed RHP JC Ramirez on the reserve list. November 25, 2015 Cincinnati Reds signed free agent RHP JC Ramirez to a minor league contract and invited him to spring training. November 17, 2015 RHP JC Ramirez assigned to Tomateros de Culiacan. November 6, 2015 RHP JC Ramirez elected free agency. November 6, 2015 Seattle Mariners sent RHP JC Ramirez outright to Tacoma Rainiers. September 8, 2015 Seattle Mariners selected the contract of RHP JC Ramirez from Tacoma Rainiers. July 27, 2015 Reno Aces traded RHP J.C. Ramirez to Tacoma Rainiers. June 18, 2015 Arizona Diamondbacks sent RHP J.C. Ramirez outright to Reno Aces. June 13, 2015 Arizona Diamondbacks designated RHP J.C. Ramirez for assignment. May 10, 2015 Arizona Diamondbacks selected the contract of RHP J.C. Ramirez from Reno Aces. December 7, 2014 RHP J.C. Ramirez assigned to Reno Aces. December 1, 2014 Arizona Diamondbacks signed free agent RHP J.C. Ramirez to a minor league contract and invited him to spring training. October 30, 2014 RHP J.C. Ramirez assigned to Gigantes de Carolina. July 8, 2014 RHP J.C. Ramirez assigned to Columbus Clippers from Akron RubberDucks. June 26, 2014 RHP J.C. Ramirez assigned to Akron RubberDucks from Columbus Clippers. June 1, 2014 RHP J.C. Ramirez assigned to Columbus Clippers from Akron RubberDucks. May 16, 2014 RHP J.C. Ramirez assigned to Akron RubberDucks from Columbus Clippers. April 3, 2014 RHP J.C. Ramirez assigned to Columbus Clippers. December 5, 2013 RHP J.C. Ramirez assigned to Tiburones de La Guaira. November 1, 2013 Cleveland Indians signed free agent RHP J.C. Ramirez to a minor league contract and invited him to spring training. October 17, 2013 RHP J.C. Ramirez elected free agency. October 16, 2013 Philadelphia Phillies sent RHP J.C. Ramirez outright to Lehigh Valley IronPigs. August 25, 2013 Philadelphia Phillies selected the contract of J.C. Ramirez from Lehigh Valley IronPigs. August 4, 2013 Philadelphia Phillies sent J.C. Ramirez outright to Lehigh Valley IronPigs. August 2, 2013 Philadelphia Phillies designated J.C. Ramirez for assignment. June 22, 2013 Philadelphia Phillies selected the contract of RHP J.C. Ramirez from Lehigh Valley IronPigs. April 19, 2013 J.C. Ramirez assigned to Lehigh Valley IronPigs from Reading Fightin Phils. March 30, 2013 J.C. Ramirez assigned to Reading Fightin Phils from Lehigh Valley IronPigs. February 1, 2013 Philadelphia Phillies sent J.C. Ramirez outright to Lehigh Valley IronPigs. January 29, 2013 Philadelphia Phillies designated J.C. Ramirez for assignment. November 1, 2012 RHP J.C. Ramirez assigned to Tiburones de La Guaira. October 4, 2012 Philadelphia Phillies recalled RHP J.C. Ramirez from Lehigh Valley IronPigs. June 4, 2012 J.C. Ramirez assigned to Lehigh Valley IronPigs from Reading Phillies. March 14, 2012 Philadelphia Phillies optioned J.C. Ramirez to Reading Phillies. October 10, 2011 J.C. Ramirez roster status changed by Philadelphia Phillies. March 12, 2011 Philadelphia Phillies optioned RHP J.C. Ramirez to Reading Phillies. October 25, 2010 J.C. Ramirez roster status changed by Philadelphia Phillies. June 18, 2010 J.C. Ramirez assigned to Reading Phillies from Clearwater Threshers. March 29, 2010 J.C. Ramirez assigned to Clearwater Threshers from Reading Phillies. March 15, 2010 Philadelphia Phillies optioned J.C. Ramirez to Reading Phillies. November 20, 2009 Seattle Mariners selected the contract of J.C. Ramirez from High Desert Mavericks.